Niall Horan chooses the Tracks of My Years with music from Chris Brown and Elton John. Ken also chats to Jo Whiley about BBC Introducing's 10th Birthday. 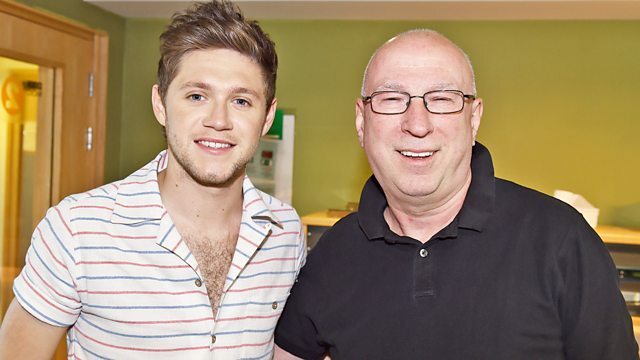 Niall Horan, one-fifth of the all-conquering boy band One Direction, chooses the Tracks of My Years with music from Chris Brown and Elton John. In 2010 Niall auditioned as a solo artist for the seventh series of ITV's The X Factor. He failed to progress to the "Boys" category at the "judges' houses", but after judge Nicole Scherzinger suggested he join One Direction with Harry Styles, Zayn Malik, Liam Payne and Louis Tomlinson, the group became a reality. Since the band's temporary hiatus Niall has recorded his debut solo album which is due to be released this autumn. Ken also chats to Jo Whiley about the 10th birthday of BBC Introducing, the place where undiscovered new artists can get their big break, with success stories including George Ezra, Blossoms and Florence and The Machine. There's also the daily love song, record and album of the week plus PopMaster. If you'd like to get in touch with the Show email Ken.Bruce@bbc.co.uk. Fantastic 80's Disc 1 (Various Artists). Tears On The Dancefloor: Crying At The Disco Deluxe Edition. 20 Songs Of Love From The 70's (Vario.